When you start investing it’s similar to learning a new language. There are many unfamiliar terms and concepts. It can be hard to make sense of it all. Fortunately, you can learn more with just a few clicks through our financial literacy section. Whether you’re a veteran trader, or just hear financial news in passing, you’ve likely heard about bull and bear markets. As of late, many people are talking about bull markets. President Trump tweeted, “Longest bull run in the history of the stock market, congratulations America!” Analysts often disagree on whether or not this is the longest bull market in U.S. history. Although, those disagreements stem from how you define bull and bear markets. Whichever definition you prefer, one things is true: every bull market eventually becomes bearish. 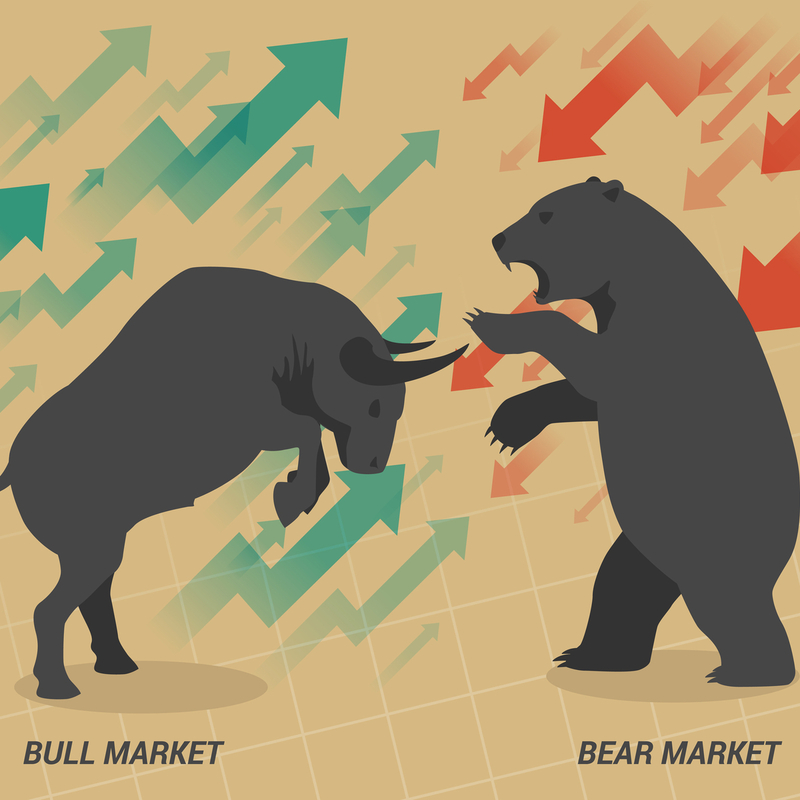 Today, we will explain the basics of bull and bear markets. A bull market is a market that is increasing in value. Typically, when someone is talking about a bull market, they are referring to the stock market. Although, it can refer to any market trading securities. Bull markets make investors optimistic. And optimistic investors are usually keen on buying, and less likely to sell. There is not one singular definition for a bull market. But this definition is a good rule of thumb: a bull market is a market in which the stock prices rise 20% after a previous drop of 20%, and before another decline of 20%. Recognizing bear and bull markets are obvious only in hindsight. A 10% decline in the market is known as a “correction.” Market corrections happen, and do not necessarily indicate an upcoming bear market. However, we know now that when the market began to decrease in value in 2000, known as the “.com” bubble burst, we were headed for a bear market, not merely a correction. Conversely, when the S&P 500 significantly increased in value from 2003 to 2007 we know that was a bull market. In other words, the markets rose 20% after a previous drop of 20%, and before another decline of 20%. The conditions of a bull market include low unemployment, high GDP, and rising stock prices. A bear market is the opposite of a bull market. In bear markets, securities decreasing in value. A weakening or sluggish economy is an indicator that a bear market is approaching. That impending sense of a market crash scares investors. In turn, lower market activity reduces the value of the traded securities. The aforementioned 20% rule of thumb applies here: bear markets happen when stock prices fall 20%. The last bear market in the U.S. was the 2007-2009 financial crisis. Bear markets are usually associated with high unemployment, plummeting stock prices, and fear of a recession. Another 17th century theory suggests that the term “bull” originates from the London Stock Exchange bulletin board. A board full of bulletins meant the market was strong, while a bare bulletin board meant the market was weak. Perhaps the most popular origin story for bull vs bear markets comes from how the animals physically attack. A bull thrusts its horns upwards, while a bear swipes its claws downward. In a bull market, investors can take advantage of rising prices by buying early before stock prices skyrocket. Investors can focus on growth stocks with higher return potential. Most stocks fall during a bear market, but not all recover. Investors are better off short selling or making safer investments, such as fixed-income securities. It also may be a good time to buy beaten down blue-chip companies that are poised to survive the bear market. To improve the diversification of your portfolio, check out our stock position size calculator.